There is something magical about stop motion. It reminds me of watching The Clangers and Camberwick Green as a child. It’s not perfect. I think that’s what it is. You can see the slight imperfections in the movements, the fingerprints smoothed into the sides of faces, it looks homely. With that in mind I am not concerned that Burton has returned to stop motion once again because not only do I love stop motion, I also love the characters he creates and the morals he places in his stories. 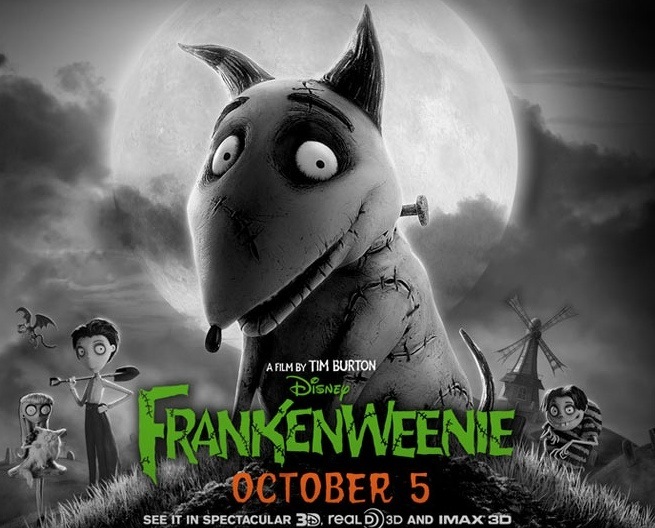 Frankenweenie is a re-imagining of the classic Frankenstein story but told almost for children. That doesn’t mean it’s all twee and pathetic like most, which seem to feel they have to dumb things down for children, this draws nicely from the original to the point that you know what is going to happen but the jokes thrown in between make up for any over familiarity. Look out for Colossus as a perfect example. What I like about Burton’s work is that he is always rooting for the loner/ weirdo/ underdog and that in the worlds he creates these people always prove to be in the right and generally everything comes through for them. Here we see that Victor’s love of science is lost on his family who feel he should be outside playing baseball like the other boys at school. In the end it is this that saves the town. Burton knows what it is to be left out, and he makes them the hero. That’s why it has such an appeal. It’s for anyone that has ever felt different and to put a horrible marketing term on it there will always be an audience for that.